Let’s just take a minute and whisk some stuff. 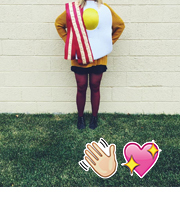 I bet you’ve got time in between sewing garlands and wrapping presents and hugging your dog. 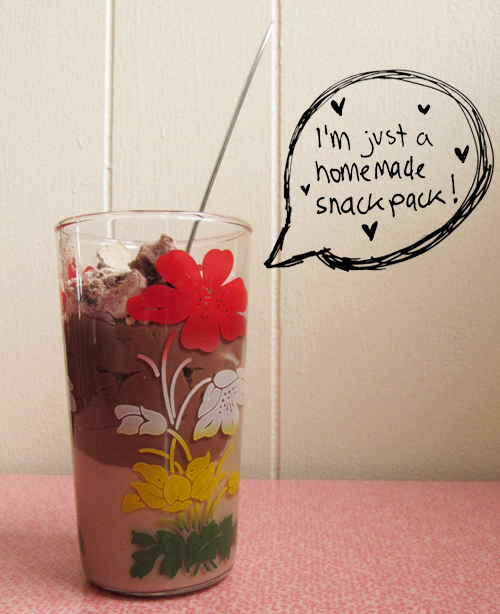 It’d be most fun to divide this pudding between little jars and bring them to work with your lunch! Because everybody needs pudding for dessert. Especially this week, right? So next time you make meringue anything or marshmallow frosting keep the yolks and make pudding! And maybe make the meringues within the same day and crumble them on top. 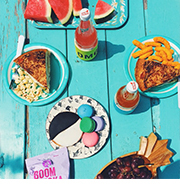 It’s deliciously encouraged. P.S. Are you guys ready for Christmas? If you’re feeling stressed just come over for pudding! We can watch Elf and then walk to get beers. 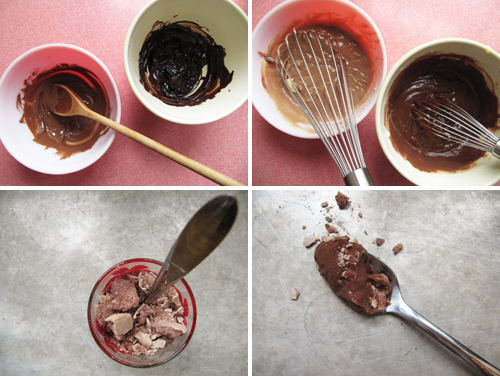 Melt the milk chocolate and dark chocolate in separate medium bowls in the microwave for 20 second intervals. Set aside. Whisk together the sugar, cornstarch, and salt in a medium sauce pan. Whisk in the milk a few tablespoons at a time, making sure to dissolve all of the cornstarch, and doing your best to smooth out lumps. Whisk in the egg yolks. Whisking constantly, cook over medium-high heat until the mixture thickens and bubbles start to form and sputter; about 6 minutes. It’ll thicken right when you think it should’ve already. Once it’s thick and luxurious reduce heat to low and continue to cook, whisking constantly for 1 minute. Remove from heat and whisk in the butter and vanilla. Divide the pudding, through a strainer, evenly between the two bowls of chcoolate. 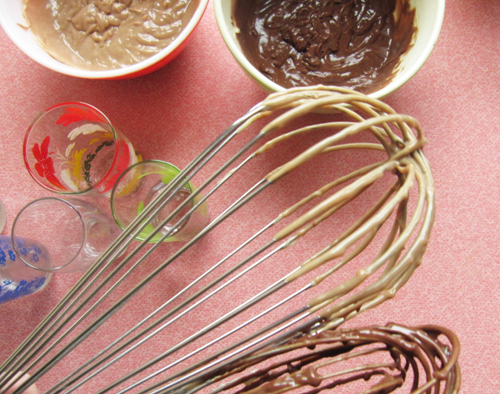 Whisk quickly to incorporate the melted chocolate. 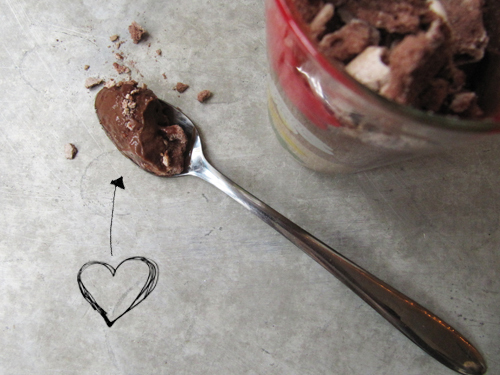 Spoon the milk chocolate pudding into individual serving cups, or transfer to a large serving bowl. Top with dark chocolate pudding. Press plastic wrap against the top of the pudding and chill for at least an hour. Remember in Billy Madison when he was all about the snack pack? Man, I used to love those, but I am positive your snack pack is a bajillion times better! Yes! haha I’m so glad you reminded me of that. This looks so good! I want to make this right now instead of going to bed. I went to bed. I have no follow through. you and cook’s illustrated are torturing me with pudding this december when I have all these christmas cookies to eat! but I really want this pudding now…maybe topped with some of the butterscotch stuff from CI. so yummy.